This kit replaces the original engine harness blocking diode in both outboard and stern drive models. 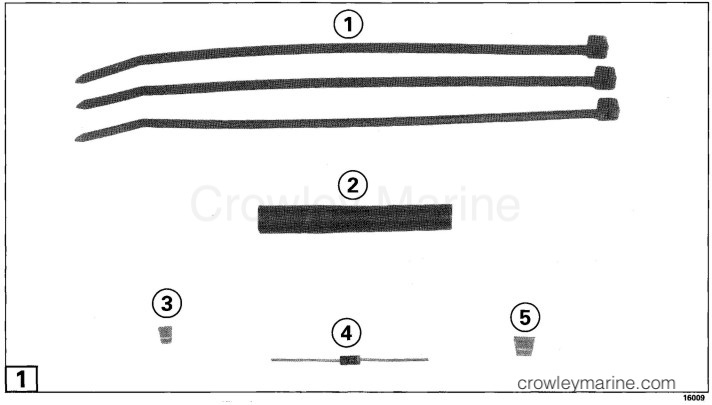 These instructions are divided into two parts, Outboard Service and Stern Drive Service. It requires splicing the diode into the wiring harness, testing and reassembly. Disconnect battery cables from battery. 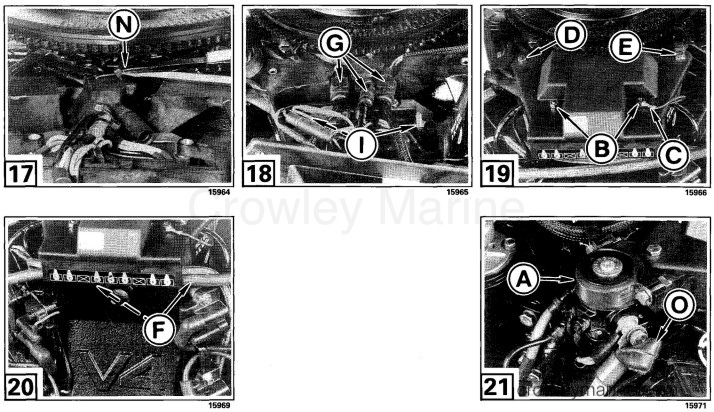 Remove and retain starter solenoid (A), nuts (B), ground strap (C), flat washer and long screw (D), short screw and retainer (E). Pull hoses (F) down from the power pack and remove power pack. Disconnect timer base and charge coil connectors (G). Cut tie strap (H). Remove mounting studs (I) and remove electrical bracket assembly. Cut tie straps and remove tape from engine cable until heat shrink tube is exposed. Carefully remove heat shrink tube from diode. Identify striped end of diode. Using white tape, mark all tan leads that are attached to striped end of diode. Cut wire leads and remove diode. Remove approximately 3/16 in. (4,8 mm) of insulation from each lead. Slide heat shrink tube (2) over all marked tan leads. Install new diode (4) with striped end facing marked tan leads. Twist lead ends around diode lead. Slide large splice (5) onto twisted leads and crimp. Place a heat sink between the diode and splice. Solder leads, splice and diode lead together. Twist single lead (L) around diode lead. Slide and crimp small splice (3) onto twisted lead. Place a heat sink between the diode and splice. Solder single lead, splice and diode lead together. Check continuity of diode; diode should read in one direction only. Cut off excess diode lead. Insulate both splices and wire leads with electrical tape (M). Slide heat shrink tube over complete splice, apply heat and shrink tube around diode and splice. Rewrap engine harness with electrical tape. Using two tie straps (1), secure wires to engine harness. Place electrical bracket on top of engine. Slide tie strap (1) through slot of bracket, around timer base leads, engine harness and back up through second slot. Secure tie strap (N) to electrical bracket. Cut off excess tie strap. Push timer base charge coil receptacle (G) together and install connections into bracket. Install mounting studs (I) and secure electrical bracket to engine. Install and secure power pack with long screw (D), flat washer and ground strap (C), nuts (B), short screw and retainer (E). Reinstall hoses (F) into slot of power pack. Reinstall starter solenoid (A). Tighten battery cable to terminal and cover with boot (O). Reconnect battery cables to the battery. There are five diodes that may need service. The G.M. 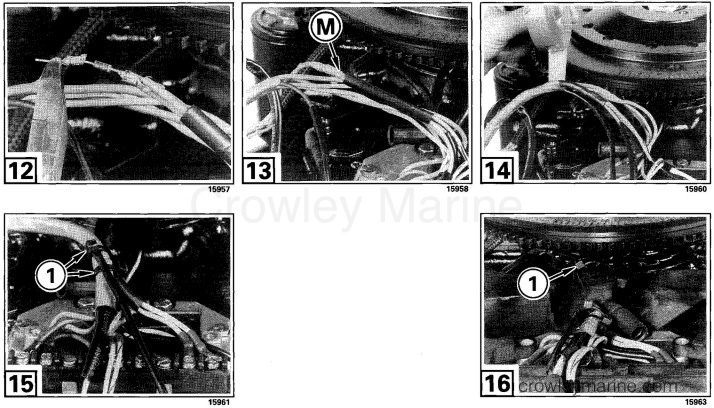 engines with electric fuel pumps have two diodes located in the fuel pump circuit and the Ford EFI engines have three diodes located in the EEC circuit. 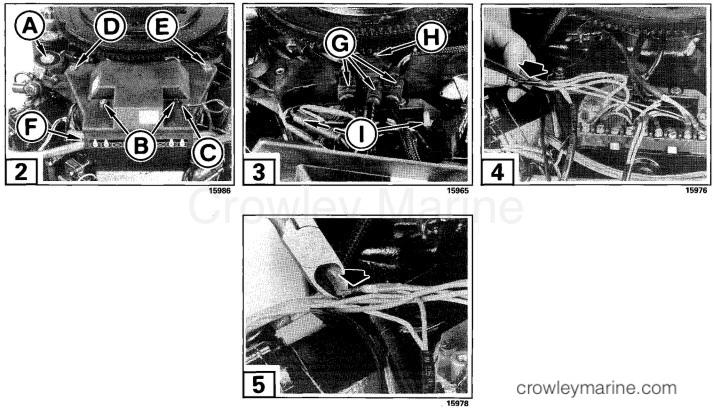 Refer to the Engine Cable Wiring Diagrams in the Electrical/Ignition Service Manual. 1. Disconnect battery cables from battery. 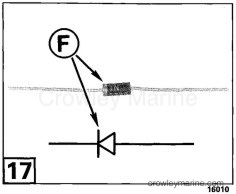 Cut tie strap and disconnect connector (A) located at front of starboard manifold. 2. 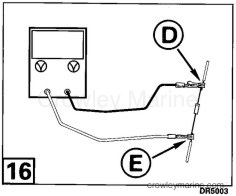 Cut tie strap (B) and disconnect fuel pump connector (C). Disconnect leads (D) to circuit breaker. Unplug relay (E) and remove screws (F) securing the relay bracket. 3. Disconnect the green lead (G) from the alternator. 4. Open clamps (H) securing electrical cable and remove cable from engine. 5. Locate the sleeve over the diodes and carefully cut over the diode to be replaced. Pull lead from sleeve. 6. Proceed to Diode Test. 1. Plug-in connector, attach wire retainer, and secure with tie strap (1) from kit. 2. Plug-in fuel pump connector (C) and secure lead with tie strap (1) from kit. Connect leads (D) to circuit breaker. Reinstall relay bracket (F) and relay (E). 3. Connect the green lead (G) to the alternator. 4. Secure electrical cable with clamps (H). 5. Reconnect battery cables to the battery. 1. Disconnect battery cables from battery. Drain cooling system, then loosen the clamp and remove the large hose at thermostat housing. 2. 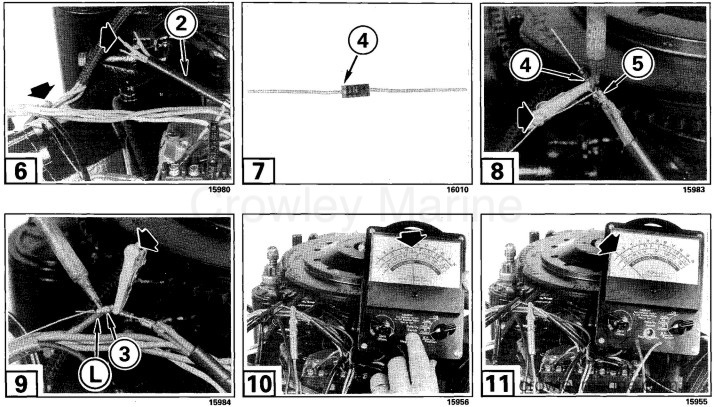 Remove tape from engine cable between the part number label (I) and the boot (J) as shown, to expose the leads with diodes. 3. Proceed to Diode Test. 1. Remove the three screws securing 10 pin connector and push from bracket. 2. Drain cooling system. Remove thermostat housing. Refer to Thermostat Replacement in the Engine Service Manual. 3. Disconnect the starboard bank spark plug leads and place out of the way as shown. 4. 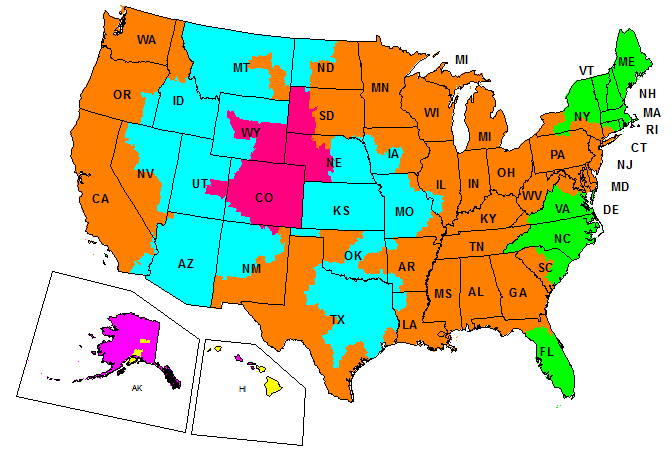 Mark diode location. Diode is located at point (A), four inches from the cable junction (B). 5. Remove cable from J-clamp (C) and pull cable away from block. 6. Carefully cut the tape to expose wires. Pull purple lead with diode away from the cable. 7. Proceed to Diode Test. 1. Cut and remove heat shrink tube. 2. Connect the ohmmeter black negative lead to cathode side (D) (silver stripe) of the diode. 3. Connect the ohmmeter red positive lead to the anode side (E) of the diode. The ohmmeter should show circuit continuity. If it does not, the diode has failed open. Reverse polarity and the ohmmeter should show an open circuit. If it does not, the diode has failed shorted. 4. Proceed to Diode Replacement. 1. Cut and remove diode. 2. Slide new heat shrink tube onto lead. 3. Install diode (4) with the cathode side (F) (silver stripe) positioned as indicated by the diode symbol in Engine Cable Wiring Diagram. Refer to the Electrical/Ignition Service Manual. 4. Secure diode by installing and crimping the two small splices (3) from kit. 5. Place a heat sink between the diode and splice. Solder leads and splice together. 6. Slide heat shrink tube over diode and splice, apply heat to secure. 7. Place lead back into cable and wrap sleeve with electrical tape.